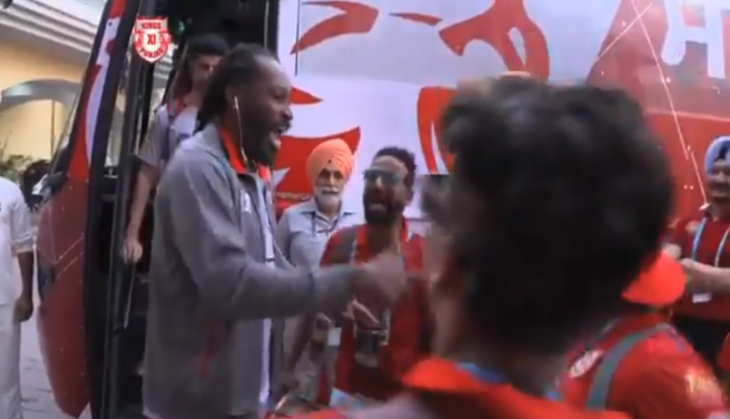 Caribbean superstar Chris Gayle who plays for Kings XI Punjab in the Indian Premier League can be seen dancing to bhangra beats. Kings XI Punjab players were welcomed with the Punjabi folk music after they reached IS Bindra Stadium for their match against Rajasthan Royals. Earlier, Gayle was spotted dancing during a brand photoshoot for his team and on the field while practicing for Kings XI Punjab. Punjab defeated Rajasthan Royals by 12 runs in the high scoring game. Rajasthan Royals won the toss and asked Punjab to bat first, KL Rahul and Chris Gayle gave their team a good start as Gayle scored 30, while Rahul went on to make a half-century. David Miller scored a fantastic 40 off just 27 balls, while Ravichandran Ashwin hit a quick-fire 17 runs to finish the innings at 182-6 in 20 overs. Rajasthan Royals failed to chase down the target. Rahul Tripathi who was promoted up the order scored 50 off 45 balls. Jos Buttler scored 23 runs off 17 balls before he was dismissed by debutant Arshdeep Singh. Ajinkya Rahane scored 26, while Sanju Samson scored 27 runs. All-rounder Stuart Binny who did not get a chance to bowl, came in and performed well with the bat as he remained unbeaten after scoring a quick 11-balls 33 at an average of 300.00. Binny was awarded the super striker of the match, while Ravi Ashwin received the man of the match award.